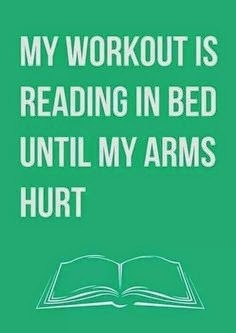 So, which books have you added to your stash of books to read?? Famous Writers And Their Cats!! I came across an article on BuzzFeed's website title 16 Famous Writers And Their Cats, which was posted by HarperCollins. I enjoyed seeing pictures of famous writers with their cats. Still haven't decided what to wear for Halloween this year??? Time is almost running out!! I came across an article on BuzzFeed titled 22 Literary Halloween Costumes For Duos by Jennifer Schaffer... Schaffer's costume ideas are awesome!! So, check them out by clicking on the above link. 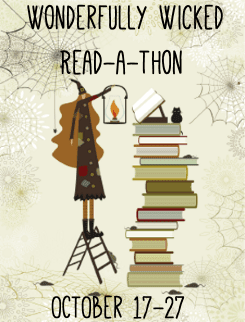 Top Ten Tuesday -- Top Ten Books To Read To Get In The Halloween Spirit! Here are my picks for the week! So, which books are your picks? Alright, I am very glad that I participated in the Wonderfully Wicked Read-A-Thon 2014!! However, I didn't reach quite complete my reading goals for this read-a-thon with all the busyness of my life and having company visiting as well. 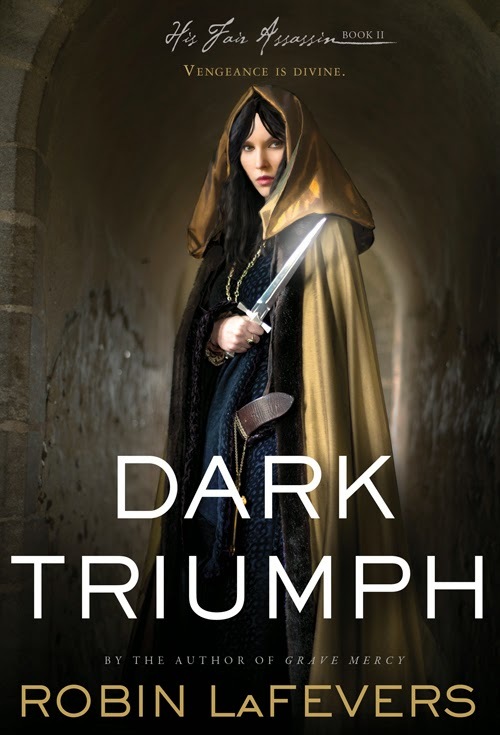 I did however manage to read and review Dark Triumph by Robin LaFevers... This book is awesome!! I highly recommend this young adult novel, especially if you enjoy reading historical fiction. I also read sixty-six pages of Instant Temptation by Jill Shalvis. This novel is excellent so far and I look forward to finishing it soon... Hopefully, before the end of October. 16 Delicious Books That Combine Food And Love. The article highlights some terrific book titles that I look forward to reading, but was surprised that the article mentions books that have been around for quite awhile!! I would have added The School of Essential Ingredients by Erica Bauermeister, Cooking for Harry: A Low-Carbohydrate Novel by Kay-Marie James, and Paris, My Sweet: A Year in the City of Light (and Dark Chocolate) by Amy Thomas to my list of favorite foodie books!! Earlier this year, I read Grave Mercy by Robin LaFevers, which is the first novel in the His Fair Assassin Trilogy. I thoroughly enjoyed reading Grave Mercy, so I looked forward to reading the second novel in the His Fair Assassin Trilogy titled Dark Triumph by Robin LaFevers as well. I finished reading Dark Triumph earlier this week and loved it!! Dark Triumph focuses on Sybella's story and journey as one of 'His Fair Assassins'. Sybella was first introduced in Grave Mercy and she was an intriguing character with a dark past that you knew nothing about... That is until reading Dark Triumph!! For me, Dark Triumph started off kind of slowly and didn't pick up its pace until around page eighty. Once the story line picked up, I was hooked and couldn't get enough of the plot, characters and how things were going to turn out!! I enjoyed reading a story told through Sybella's eyes and learning about her dark past. Sybella is a much more intriguing, multidimensional character than I ever thought she'd be from her initial portrayal in Grave Mercy. Sybella's past unfolds over the course of Dark Triumph. I enjoyed seeing Sybella's character change her point of view about life and the world around her over the course of Dark Triumph as well. I'm giving Dark Triumph a rating of 8.5 stars out of 10 stars!! I am now really looking forward to reading Mortal Heart by Robin LaFevers as it is the last installment in the His Fair Assassin series. What will we learn about the character of Annith in Mortal Heart that we didn't know before? Which books have you added to your reading list this week? Shortly after his fiftieth birthday, Leo Tolstoy succumbed to a deep spiritual crisis and decided to pull himself out by finding the meaning of life. He did so largely by reading voraciously across the world’s major philosophical and religious traditions, discovering great similarities in how they dealt with the truth of the human spirit. He was also, as any great writer, an insatiable reader of literature, which he wove together into A Calendar of Wisdom — the proto-Tumblr he spent the final decades of his life assembling. Under the heading “WORKS WHICH MADE AN IMPRESSION,” Tolstoy divides his reading list into five distinct life-stages — beginning with childhood and ending with his age at the time — and ranks each title by excellence, from “great” to “v. great” to “enormous.” Curiously, Tolstoy seems to consider the teenage years one’s most formative, prescribing for them books greater in both quality and quantity, whereas the twenties and early thirties are most meager in both and mostly occupied by poetry — perhaps because few people at the time had the luxury of leisure for reading during their most vital wage-earning years, or maybe because Tolstoy simply believed that one should be busier living than reading during that life-stage. I found it interesting to learn which books made Tolstoy's reading list. Click on top article to learn which books made the list. Four Movies to Rediscover as Audiobooks!! I love promoting audiobooks, especially now that I've become a huge audiobook fan the past couple of years. I found an article on The Christian Science website titled 4 movies to rediscover as audiobooks by Rochelle O'Gorman. Interestingly enough, the first audiobook mentioned in O'Gorman's article is Breakfast At Tiffany's by Truman Capote and is narrated by Michael C. Hall. It just so happens that I listened to this particular audiobook earlier this year and thought it was well narrated by Michael C. Hall! If you're interested in listening to audiobooks and have enjoyed watching movies that were adapted from books, then you may enjoy rediscovering the movie version through listening to the audiobook version as well! Fictionalised biographies – novels based on the life of a famous person – are ten-a-penny. And why not? They're easy enough to turn out. Other people – the actual biographers – have done the hard work. All the novelist has to do is to twist the "facts" to suit their own interpretation of the life in question, and away they go. n writing a novel based on the Young British Artists, I decided I wanted to do something different: write the biography of a made-up person as if they were real. The trick would not be to fool the reader into thinking they had actually existed (see William Boyd's Nat Tate, below) but to access that special kind of reading we slip into when reading something we assume is factual – by which I mean, basically: gullibility. Where a reader might ask, of character in a novel, "Now, would they really do that?" of a character in a biography the question would be, "Wow, why on earth did they do that?" Interested in knowing which novels made the list?? 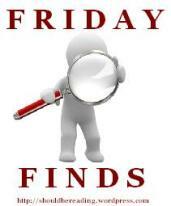 Click on the link above to to find out!! 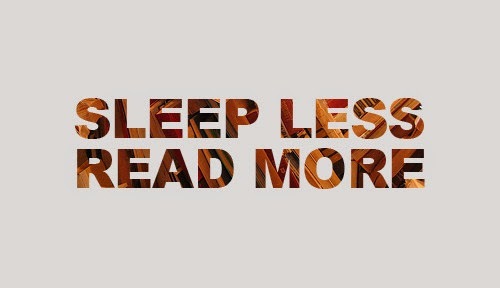 Bookish Quote pf the Day!! 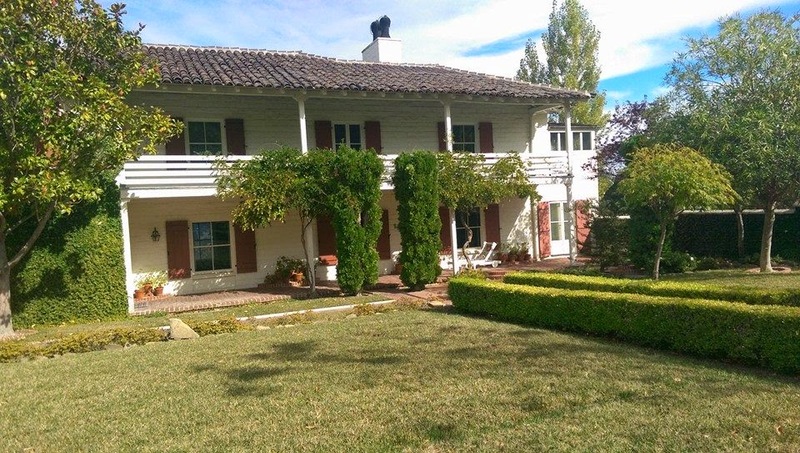 Last Thursday afternoon, I visited the Eugene O'Neill National Historic Site (aka Tao House) in Danville, California. What a fabulous literary historic site to visit!! 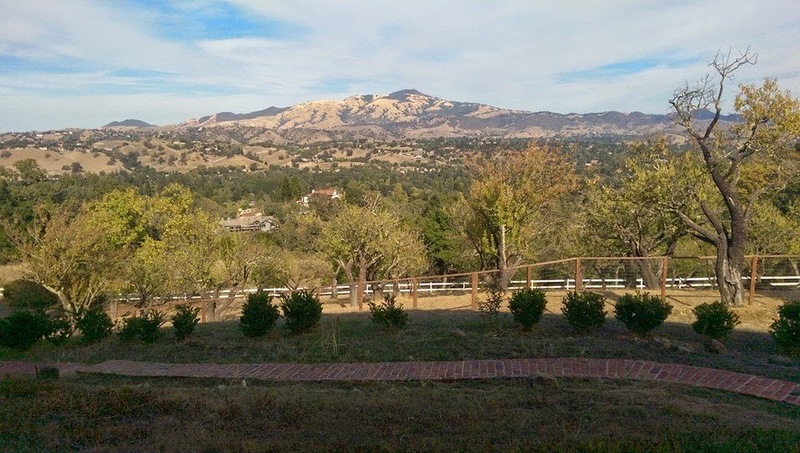 The Eugene O'Neill National Historic Site is operated by the United States National Park Service and guided tours are given twice daily by park rangers on Wednesdays, Thursdays, Fridays & Sundays... Self-guided tours are available on Saturdays. Admission is free and advanced reservations are required for guided tours. Click on above link for more information about making reservations. Eugene O'Neill is the winner of four Pulitzer Prizes and the first American playwright to win the Nobel Prize for Literature! While living at Tao House, O'Neill wrote some of his most famous plays: The Iceman Cometh, Long Day's Journey Into Night, and A Moon for the Misbegotten. 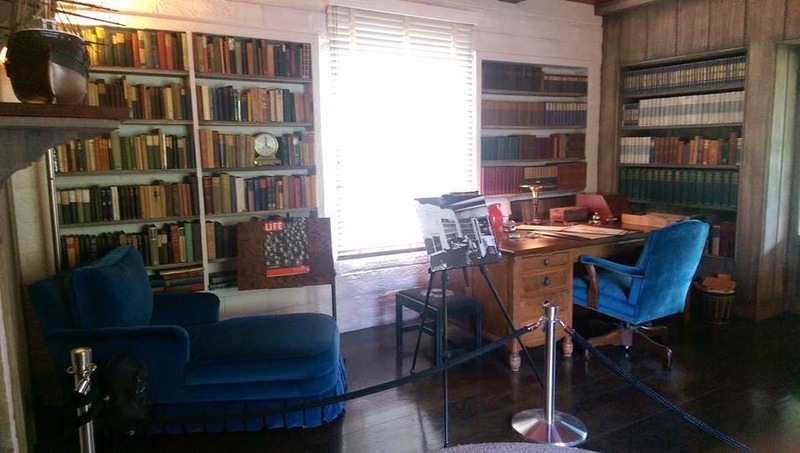 Below are two photos of Eugene O'Neill's office where he wrote his plays while living at Tao House. Visiting O'Neill's office, where he wrote some of his most famous plays was probably the highlight of my visit to Tao House. I loved the smell of old books in the office. The park ranger who gave the tour said that O'Neill owned approximately 8,000 books!! I enjoyed my guided tour of the Eugene O'Neill National Historic Site a lot. This home is an important piece of American Literary Heritage and I'm honored to have paid a visit to a place filled with such a rich history. 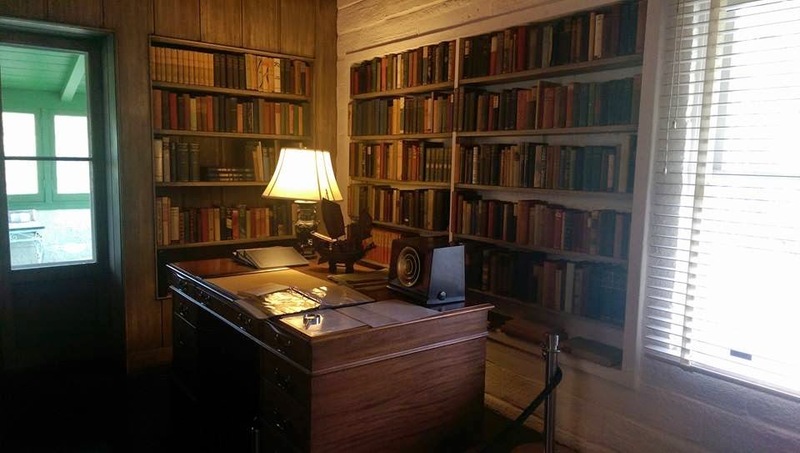 For all of you literary fans, I hope you are able to pay a visit to the Eugene O'Neill National Historic Site some day in the not so distant future. It's definitely worth the visit. I was tagged by Vonnie at Vonnie's Reading Corner to participate in the Seven Deadly Sins Book Tag!! This should be a fun meme to participate in... I'm looking forward to putting on my creative thinking cap and answering the questions below. There are seven questions. Each question will address one of the 'seven deadly sins'. I have to answer each question with a book title/titles that addresses that particular 'deadly sin'. 1. Greed - What is your most inexpensive book? What is your most expensive? Well, I've downloaded several free ebooks from Amazon to my Kindle over the years... Too many ebooks to count or list here actually... So, my most inexpensive books are the freebies from Amazon. The most expensive book on my shelves?? Wow, tough question! I'm not sure which book is my most expensive 'buy'... It's not like I collect rare books or anything like that and most of my book collection is still sitting in boxes since we've moved. I'd have to say/guess the book that probably fits the bill is S. by J. J. Abrama & Doug Dorst. It's $35. Tamar Myers fits this one for me... I have been reading her Den of Antiquity cozy mystery series and am almost done with it. My complaint is that some of the novels in this series are fabulous while others are duds. I wish all of the books were consistently well written. A Hero of Our Time by Mikhail Lermontov --- I love the characters and the way in which this book is written/laid out. 20,000 Leagues Under the Sea by Jules Verne --- This book is so detail oriented. I feel like I'm right there in all the action. I've been lazy about finishing both The Outlander Series and the Lord John Grey series by Diana Gabaldon. Love Gabaldon's writing, but her books are soooooo loooonnnnng! 5. Pride - What book do you talk about most in order to sound like an intellectual reader? There isn't a specific book title that fits this category, but a specific genre. Usually some sort of nonfiction title works/fits in an effort to sound like an intellectual... Especially, if it is a recent nonfiction title. For male characters, think of Jamie Fraser from The Outlander Series by Diana Gabaldon. Do I need to write more??? I have no idea really, but probably a first edition of a book I've loved reading, like a Russian first edition of The Master & Margarita by Mikhail Bulgakov or first edition of East of Eden by John Steinbeck. I am tagging the following seven people to participate in the Seven Deadly Sins Book Tag... Mainly, because I'm curious to see which books and authors show up on their list!! This is a book group selection!! I purchased it last weekend. Given to me by another avid reader! An eBook download through Amazon. I purchased book yesterday while visiting the Eugene O'Neill National Historic Site in Danville, California. So, which books did you add to your reading pile this week?? 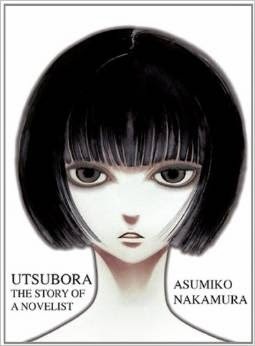 I recently read a manga novel titled Utsubora: The Story of a Novelist by Asumiko Nakamura. I am currently trying to expand my reading horizons by branching out and exploring new (to me) genres and/or authors... And Utsubora: The Story of a Novelist by Asumiko Nakamura fits the criteria as prior to now, I'd never read anything written by Asumiko Nakamura. Nor has the manga genre been a big interest to me personally. Alright, so what initially grabbed my attention/caught my eye about Utsubora: The Story of a Novelist by Asumiko Nakamura?? The art work on the front and back of this novel definitely has curb appeal. The summary of the book itself on the back cover also made the thought of reading this novel appealing... And that fact that this novel is for adults 18+ also piqued my interest. So, with these three things in mind, I went ahead and purchased a copy of Utsubora: The Story of a Novelist by Asumiko Nakamura. What did I loved about Utsubora: The Story of a Novelist by Asumiko Nakamura?? 1. The art work is nicely done! 2. This novel is more complex than I ever expected it to be. It's filled with many layers, like peeling an onion. It has a lot a depth to it and I still doubt I completely grasp the 'big picture' when it comes to fulling understanding this novel in its entirety. 3. Quick read... Even though this novel is 400+ pages, it can be read within a couple of hours. What I did NOT love about Utsubora: The Story of a Novelist by Asumiko Nakamura?? 1. The teeny tiny writing, which made it difficult to read the text for my aging eyes!! 2. The bubbles where dialogue fit, didn't always clearly mark which character was actually speaking the words. This made you have to really work hard at times figure out who was saying what. 3. This novel didn't seem to follow a linear fashion... It seemed like events of the past were mixed into what was going on in the present making things confusing. 4. Some scenes/events were difficult to follow. I don't want to have to work that hard trying to make sense of the unfolding events, etc in a novel. Young author Aki Fujino appeared poised to making it big in the world of publishing. Her debut title UTSUBORA was being pitched about to a number of editors and at least one person felt it was set to propel her into stardom. However, before she could ever have her book published, the young woman was found dead. Some believe it was a suicide, but those close to her feel there is something more sinister involved in this young talent's death. Aki's death has become something straight out of a mystery. Much like the story behind UTSUBORA, there is something more to Aki, Sakura and their relationship with an author named Mizorogi than meets the eye. And it is possible that the only way to solve this mystery may be to uncover all their secrets. Overall, I didn't enjoy reading Utsubora: The Story of a Novelist. It wasn't my cup of tea. I'm giving it a rating of 3 stars out of 10 stars. The Marilyn Monroe Reading Challenge? Unbeknownst to me, Marilyn Monroe had 430 books in her own personal library. I discovered this through an article I found on the Open Culture website titled The 430 Books in Marilyn Monroe's Library: How Many Have You Read? I only gave a passing glance at most of the book titles mentioned... In fact, I didn't even review the entire list of books in the above article!! 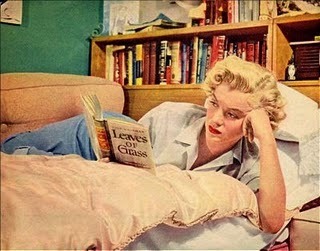 But is begs the question, are YOU up to the Marilyn Monroe Reading Challenge?? Would you want to read all of the books listed in Marilyn Monroe's library?? I can't say as I'd be interested in reading many of the titles mentioned. Some of the classics mentioned, sure... But rest of them not really. 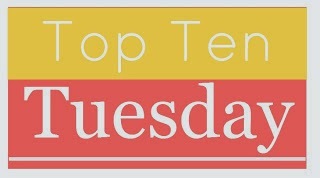 Top Ten Tuesday --- Ten Places Books Have Made Me Want To Visit! 1. After reading A House in Fez: Building a Life in the Ancient Heart of Morocco by Suzanna Clarke, I want to visit Morocco! 2. After reading The Sacred Well by Antoinette May, I now want to visit Chichen Itza, the Mayan ruins, in Mexico's Yucatan. 3. I love elephants, so I want to go on an African Safari after reading Larger Than Life by Jodi Picoult. 4. I'd now like to visit the Channel Islands off the coast of England after reading The Guernsey Literary And Potato Peel Pie Society by Mary Ann Shaffer and Annie Barrows. 5. I want to visit Turkey (and maybe even live there) after reading Tea & Bee's Milk: Our Year in a Turkish Village by Ray and Karen Gilden. 6. Alright, I admit that I didn't much enjoy Eat, Pray, Love by Elizabeth Gilbert, but I must also add that I'd love to take a year off from everyday life, like Ms. Gilbert did, and spend my time in Italy, India, & Indonesia. 7. Ride on the submarine, the Nautilus, from Twenty Thousand Leagues Under the Sea by Jules Verne and have an adventure with Captain Nemo! 8. The convent of St. Mortain in Grave Mercy by Robin LaFevers to learn how to be 'His Fair Assassin'. 9. The Christmas Train by David Baldacci reminds me that at some point I'd love to take a long distance train trip on Amtrak. The trip doesn't have to be during the Christmas holiday season, but it would be fun to either travel across country by train at least once in my life... OR take the Amtrak Coast Starlight from Los Angeles, California to Seattle, Washington. 10. I love sweets!! After I read Paris, My Sweet: A Year in the City of Light (and Dark Chocolate) by Amy Thomas in 2012, I wanted to eat all the lovely treats that the author enjoyed while living in Paris. I enjoyed reading an interview with Jodi Picoult in the New York Times called Jodi Picoult: By the Book!! It was enlightening and wonderful to read. I hope you enjoy reading it too. Click on the link above to read it. Until my next post, happy reading!! I recently read Firegirl by Tony Abbott, which is a young adult novel. I enjoyed reading this novel and was riveted by the writing from the start! Firegirl is told through the perspective of a 7th grade boy named Tom Bender. I really like Tom Bender's character. He's smart, sensitive, compassionate and is able to convey the feelings he's experiencing in an articulate and credible manner. It's a pleasant experience to discover male characters in novels that display the kind of emotion sensitivity and feelings that Tom Bender's character expresses in Firegirl. "This novel may be brief, but it leaves a big impact." "Tom's a normal seventh-grader, negotiating a slightly prickly stage in his long friendship with Jeff...The arrival of new girl Jessica Feeney, however, changes everything; Jessica, who is attending a local hospital for treatment, has been badly burned by a fire, and her terrible disfigurement shocks the class into confusion. This isn't the usual book about adjustment to difference; instead, Abbott brilliantly explores the kids' struggle to manage the intrusion of abnormality in their lives...this is a thoughtful exploration of a brief interlude's lasting impact." I'm giving Firegirl an overall rating of 8 stars out of 10 stars. Checkout the awkward bookseller moments by clicking on the link above!! 2014 Nobel Prize for Literature Goes to French Writer Patrick Modiano! Congratulations are in order for French writer Patrick Modiano! Frankly, I'd never heard of him before today. Have you? I'm now curious about his published works. STOCKHOLM—French author Patrick Modiano won the 2014 Nobel Prize for literature on Thursday, bringing international attention to an author known for his elegant and spare examination of memory, identity and loss. Mr. Modiano said he was aware that his name featured among potential contenders but was bowled over by the announcement. Click on the above link to read the full story. 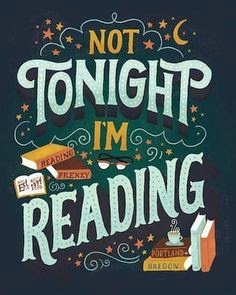 Until my next post, happy reading!! Love Music? New Music Related Books in Time For Fall! I noticed that Parade Magazine had an article titled 17 Great New Music Books for Fall... I've been listening to a lot more music lately, so this article appealed to me!! The above article mentioned that "A bevy of great books by and about musicians is hitting store shelves this fall." I definitely wanted to check out which books made this list of music books coming out this Fall!! The Universal Tone by Carlos Santana and The Beat of My Own Drum by Sheila E. sound the most appealing ones to read. Songwriting is a competitive business, with each artist keen to prove that they're more knowledgeable and artistic than their peers. So what better way to do that than to name check, or draw inspiration from, a respected book? In addition, usefully, it means that you don't have to think too much about the lyrics - so that's half your job done already. We've taken a look at 25 excellent examples where the world of music has been inspired by the world of literature. Cross-art-pollination ahoy. Intrigued by the article's title, I decided to check out which 25 songs reference books!! DIY Projects Using Old Books!! Are you a crafty type of person??? Do you love books like me??? Then perhaps you might enjoy re-purposing old books and turning them into the following nifty DIY Projects Using Old Books! !